Gerald O. 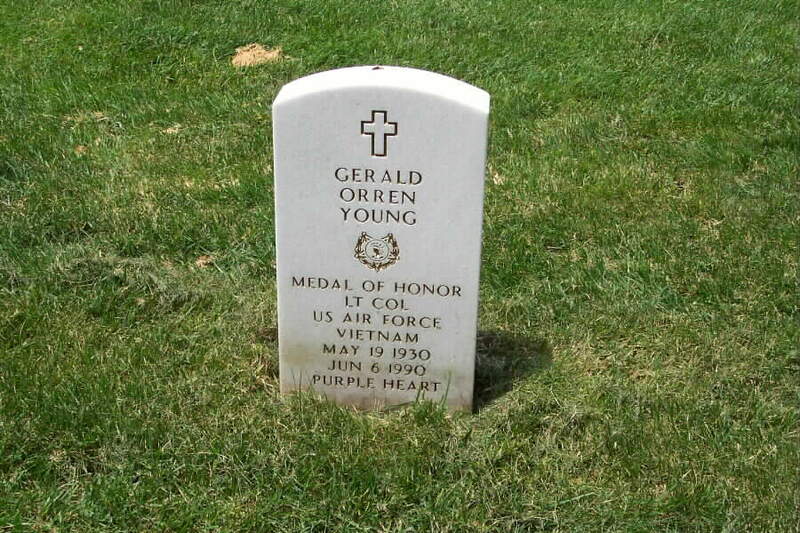 Young was born in May 1930 in Chicago. He entered the Air Force at Colorado Springs, Colorado. In 1967, he was an instructor pilot with the 37th Air Rescue and Recovery Squadron, Da Nang, flying HH-3E Jolly Green Giant helicopters, rescuing downed pilots and crewmembers from the Vietnam jungle. By November 9, 1967, he was a veteran of 59 combat missions. His 60th mission would result in his earning a Medal of Honor. Young, then a captain, and his crew were flying as backup for another helicopter on this night operation, accompanied by a C-130 flareship and three Army gunships. The previous afternoon, a U.S.-South Vietnamese reconnaissance team had been surrounded by a North Vietnamese battalion. Two helicopters had been shot down during a daylight rescue attempt. Young had his crew volunteered to help rescue the team. The team was in an area southwest of Khe Sanh. Low-hanging clouds shrouded 5,000-feet peaks to his left. Visibility was poor. It wasn't the best night to launch a rescue mission, but Young and his crew headed into the area. The first helicopter managed to pick up three members of the team before extensive battle damage forced it to withdraw. The commander of the craft advised Young that intense enemy fire made the rescue of two soldiers left behind all but impossible. Accompanying gunships were also running low on fuel and ammunition. Despite the danger, Young decided to make one more attempt to pick up the two team members left behind. He guided his helicopter down into the flare-lit darkness, touching down on a slope not far from the two soldiers. Both wounded, they were loaded aboard under heavy attack with enemy troops closing in. As it moved forward for take off, the HH-3E was fired on at point-blank range. A direct hit exploded one of the Jolly Green's engines, flipping the craft over on its back as it burst into flames and crashed down the hillside. Young was hanging upside down in his harness. He dropped out of the cockpit window and rolled down the slope, his parachute on fire. Although badly burned, he beat out the flames and gave aid to another crew member, a sergeant, who had also escaped. Not knowing if there were other survivors of the crash, he crawled 100 yards up the hill toward the flames, but was driven back by intense heat and enemy fire. When enemy troops approached the crash scene, he led them away from the wounded sergeant hidden in the underbrush. He took off through the brush, enemy troops following him. Young knew that the only way rescue helicopters would be able to reach the scene and recover any remaining survivors was if they could see and have time to operate without encountering enemy fire. Young was determined to give them that time by luring his pursuers farther and farther from the wreckage. In his condition, that meant almost certain capture or death. After stumbling for six miles, he eluded the North Vietnamese troops in pursuit. Each step during the long night was sheer agony and a triumph of will over pain. Finally he eluded the men following him and 17 hours after the crash, called in a helicopter to pick him up. He immediately informed his rescuers of the position of his fellow crew member. Young spent six months in hospitals, recovering from his burns. In May 1968, he was awarded the Medal of Honor by President Lyndon Johnson at a ceremony dedicating the Pentagon's Hall of Heroes. Before retiring as a lieutenant colonel in 1980, Young served at the Air Force Academy, flew with the VIP transport squadron out of Andrews Air Force Base, Md., and was air attache to Columbia. 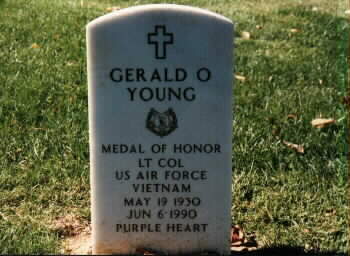 Young died June 6, 1990 and was buried in Arlington National Cemetery. 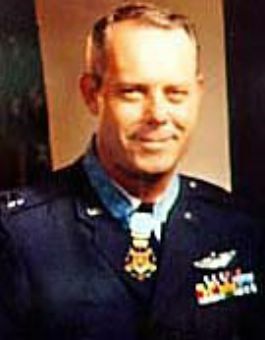 Born at Chicago, Illinois, May 19, 1930, he earned the Medal of Honor during the Vietnam War while serving as Captain, United States Air Force 37th ARS, DaNang Air Force Base, Republic of Vietnam, November 9, 1967. He died on June 6, 1990 and was buried in Section 7-A of Arlington National Cemetery near the Tomb of the Unknowns. Rank and organization: Captain, U.S. Air Force, 37th ARS Da Nang AFB, Republic of Vietnam. Place and date: Khesanh, 9 November 1967. Entered service at: Colorado Springs, Colorado. Born: 9 May 1930, Chicago, Illinois.